Last night I went to an establishment in Spokane County that has tons of patrons. While in the bathroom a needle disposal unit on the wall piqued my interest. I have no idea how much time it takes for a disposal unit to become full at this place. I imagine there should be specific procedures for disposing of used needles. Take such measures as he or she deems necessary in order to promote the public health, to participate in the establishment of health educational or training activities, and to authorize the attendance of employees of the local health department or individuals engaged in community health programs related to or part of the programs of the local health department. The Department of Ecology has guidance on pharmaceutical waste. 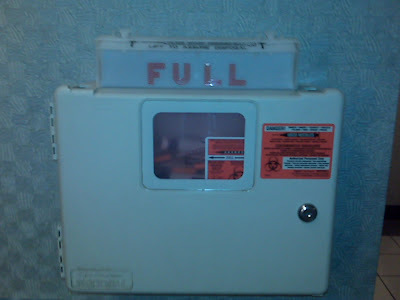 The Spokane County Medical Examiner uses the incinerator at Holy Family Hospital for its medical waste, including used needles, but that guidance seems to only apply to their office and not the county in general. According to Waste Management they offer "a safe, confidential and cost-effective medical waste disposal system. It provides individuals, companies and institutions a way of disposing of used hypodermic needles, lancets, test strips and other medical waste. Each system includes a specially designed container, a postage-prepaid return box and tracking form; to ensure your medical waste will be delivered safely by the U.S. Postal Service to a certified medical waste resource recovery facility for destruction." You have to call for details which seems appropriate since they operate in a number of states that would quite likely have differing regulations. The Spokane Regional Solid Waste center addresses the disposal of household medical waste and has separate guidance for used needles coming from businesses. Sharps containers from businesses cannot be commingled with other solid wastes. Businesses such as dental offices and doctors offices may dispose of sharps at the Northside Landfill located at 7202 N. Nine Mile Road. Businesses do pay a fee for sharps disposal. Businesses may also hire a private medical waste company to manage the disposal of sharps. Please check your local phone book under "Waste Disposal / Medical." Now it's my understanding that the Northside Landfill has been closed for a number of years now. Since the businesses mentioned are medical in nature I'm still not clear on the requirements placed on a non-medical establishment that provides containers for their customers' used needles. So I guess I'll ask the next time I'm out there.